Jon Ortiz of the Sacramento Bee has dubbed the State Board of Equalization (BOE) headquarters in the state capitol as a “Terror Tower,” with good reason. Since the 24-story office building opened 21 years ago, taxpayers have “shoveled about $60 million into combating defects that have plagued the tower, including invasive mold, leaking windows, burst pipes, unreliable elevators, falling glass and traces of toxic substances.” The cost to fix everything is another $30 million and it would be very costly to move around some 2,000 employees during repairs. In 2007, the state bought the building from CalPERS for $80.7 million and the debt, currently $77 million, won’t be paid off until 2021. What about a lawsuit against contractors and sub-contractors for obviously defective work? As Ortiz notes, “the state’s statute of limitations for defective construction is four years or 10 years, depending on the type of defect” and “the BOE headquarters’ litigation clock ran out in 2002.” So somebody was looking the other way. Assemblyman Roger Dickinson wants a new facility that would cost an estimated $500 million, plus the cost of paying of the debt on the Terror Tower. So in typical government style the money pit gets deeper, all for a bloated bureaucracy of dubious utility. 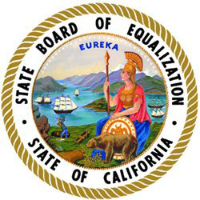 The Board of Equalization dates from 1879 and its mandate was to ensure that property tax assessments were uniform across all California counties. The BOE no longer “equalizes” anything but collects a variety of taxes and fees. As an elected body the BOE provides a comfy landing spot for termed-out politicians. They represent government to the public and create new ways to shake down taxpayers. In 1996 the BOE attempted to tax editorial cartoons as though they were works of art purchased in an art gallery. The proposed “laugh tax” made California a national joke, so no surprise that even the board’s headquarters is a disaster. On the other hand, the BOE confirms that government waste, fraud and abuse are always worse than you think.